It is just a huge honor for me today to be podcast interviewing Rachel Wall, whose been a mentor of mine at Inspired Hygiene for 25 years. I mean you've just been out there crushing it in dental hygiene. She's out there in Charlotte, North Carolina as a founder of Inspired Hygiene, Rachel and the Inspired Hygiene team inspire dental teams to elevate their hygiene services and systems while increasing profitability. Drawing from her 25 years of experience as a clinical hygienist and hygiene profitability coach, Rachel delivers to the point articles and speaking programs. She has spoken for everyone from numerous organizations, Yankee, ADA, Hinman. She received a 2012 Dental Excellence Award from DrBicuspid.com. Which by the way I'm in Phoenix, they're just up the street in Tucson. And for most effective dental hygienist educator and was named one of the top 25 women in dentistry in 2013 by Dental Products and Report Magazine. Congratulations on that. That's two huge honors. Actually they named me, Dental Products and Report did name me top 25 fattest dentists and T-Bone made the list too and he's right up the street from me, right? He is, I love T-Bone. I'll give him a shout out. When we won the awards he was eating a steak and I was at Dairy Queen. Rachel can be reached by email at Rachel@inspiredhygiene.com or by phone at (704) 541-0995, and by the way, when you spell Rachel it's Rachel. I always want to spell it Rachael. So it's Rachel, she says it's spelled the right way. And your phone again, if you're at the 7-Eleven or Circle K write it on the bathroom wall, (704) 541-0995 for a good time. She's also worked as a hygienist in the Perio Faculty Practice at UNC for three years with some of the premiere Perio researchers, David [Pacat 00:02:15], Steven [Offenbocher 00:02:16], Ray Williams. Was a student and participated in some data collection and studies on perio and pre-term labor at UNC. She's based in Charlotte, but she has coaches and clients all across the U.S. You've got one in my back yard in Phoenix. Kim, what's Kim's last name? Kim Miller and I already like her because Miller beer, they came out with the first light beer. I mean I already like her. ... and it's funny that you were on the data collection studies on perio and pre-term labor because when you talk to the insurance companies, the thing they are most interested in, the only thing they talk about at the Oral Health Connection is the data they see when you have a preemie, it's a million bucks. They're linking gingivitis and gum disease, and the last thing an insurance company wants is for someone to have a one or two pound baby. I mean that's just the most expensive thing out there. I think pregnant women healthcare is gonna be the first connection because in America you can take it to the bank that money is the answer, what's the question? When those hospitals think about dentists they just think, "How do you keep pregnant women with gingivitis from dropping a preemie?" So, you've got a new book out? We have our new book. This was one of my babies, but, you know, as we all say with our businesses or our books, I have two real life kids. Seven and almost 10. Anna and Andrew, and they're a blast. Well, I always say ... That the book is on ROH.com or InspiredHygeine.com? The easiest way to find the book is ROHBook.com. ... and the ROH stands for Return on Hygiene. I love that name. Then it's gonna redirect you to Inspired Hygiene. I know you're driving, so what I do is I always retweet my guests last tweet and her last twitter tweet ... She's at @InspiredHygiene, and I just retweeted two of her tweets, one was, "In Jamie's latest video she shared some inspiration for the next six months, don't let the next six months slip by." Then another one,"Rachel, Kim, Jamie and Emmy are excited to be going to the Speaking Consulting Network in Orlando, June 9th to the 11th." ... and we scheduled the next two years in Orlando just because millennials really don't want to smoke, drink martinis, and gamble. It's more of a family fun practice place, plus I have two grandkids, that's kind of motivating me. So tell us about your book. I mean I know that's a huge undertaking. What made you want to write a book? Well, it was time, Howard, we've been doing this for ... Inspired Hygiene started in 2004, so I've been doing this for a while. Kim, Jamie, Emmy, that's our coaching team, so we're all going to SCN together. That's actually where I met T-bone was at SCN in Vegas, gosh, probably about 14 years ago, right about the time when I started Inspired Hygiene, so we've known each other for some time. It was way overdue and just like we coach our clients, I have coaches, all of us in business should have coaches, and mentors, and people that help us get to the next level. The part of here advice, she said, "You know, you developed this platform, we're speaking all over the country, but what's a way to get this message out even more and really help dentists look at, how do we get a strong return on the investment of time, money, energy, leadership? 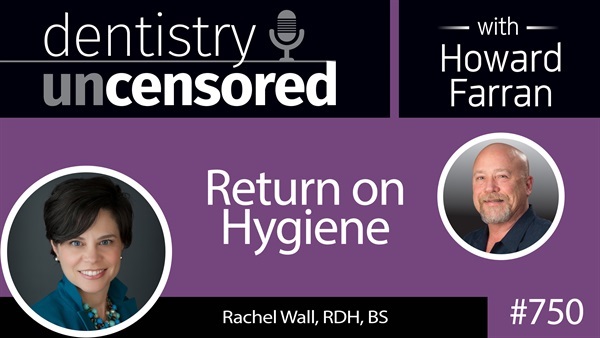 How do we get a strong return on all of that investment in the hygiene department that benefits the patients, first and foremost, the providers, that benefits the hygienist, and also, the practice?" So, we kind of took what we've learned about some of the stats of the hygiene department, I call this the hygiene benchmark bible. If you want to know how your hygiene department stacks up against industry standards and other practices across the country, this is a good way to find out. We just really give some good formulas, some things that dentists can really plug in the numbers and see where their hygiene department stands, and where there might be some opportunity to grow and get a really strong return on the hygiene department. ... because they're always off to another implant course. Do you feel that way? I hear that a lot from dentists themselves. They'll call and say, "Hey, we haven't really been paying much attention to our hygiene department and I've been at all of these other courses, and now it's time to focus here." I remember years ago, when we were in a practice here in the Charlotte area, one of the dentists was showing me, he had like the next generation [serac 00:08:15] that hadn't even been released. He was just showing me all the bells and whistles, and he was one of the instructors, a really, really great practice. I asked him, I said, "Okay, this is great, you're using next year's technology, can I give you a little bit of coaching." He said, "Sure, that's why you're here." I said, "Your hygienists are using ultrasonic units from 1990 and it's time to step it up." He said, "Great, whatever you suggest, we'll do it," and they did, and they got great results clinically and also with the [inaudible 00:08:43] of their hygiene department. So yeah, that happens a lot, actually. The order your book in InspiredHygiene.com and how much is the book? The book is 19.95, but we have a promo code so everybody can get it for half price. So, 9.95 and the promo code when they go to check out is HOWARD. You have your very own promo code, Howard, that will live into eternity. She chose the name Howard after Howard Stern, it wasn't me, it was just Howard Stern. Because, as I said, you're the Howard Stern of dentistry [crosstalk 00:09:21] well. ... the dentist is driving to work right now, they've got an hour commute to work, or they're on a treadmill, or whatever. You only know what you know, you don't know what you don't know. They just have a hygienist, they have a department. Any time you get in a serious conversation with them it's on bonding agents and implants, or whatever, but when you ask them details like, "Well, how do you confirm your hygiene?" They can't even tell you. ... and I always track the biggest return on investments is bringing in a consultant to get your house in order. ... that by the time they got 5,000 charts, they have 1,000 people. If they could work on those two funnels, they'd double their net income, and then their next question is, "What bonding agent do you use?" Yeah. It's interesting you say that because I've never ... I've heard you say that before, but I've never really thought about it and I am the worst drawer in the world, but it's kid of like the hourglass, right? You've got all these people coming in, but only a few stay here, and then you've got all these people going out, so you're left with this small amount of patients here that are really committed. The first step is really figuring out, who are those people? How many of them are there? Because dentists are making hiring decisions, they're making buying decisions, they're making construction decisions, sometimes based on the number of charts, but those people aren't in care. First, it's important just to find out, what are we looking at? It's like an eBusiness, the numbers aren't always the most ... In fact, sometimes they can be a little depressing, but once you know what they are and you starting tracking it, then you can make improvements. If we have our head in the sand, then it never gets any better. I would say, I've heard you say this and I just totally believe it is, the most successful dentists aren't the ones that go to this [inaudible 00:12:42] and then try to translate everyhting to everyone, they're the brings that bring their whole team to the [CE 00:12:49] and they learn it together. Now, all of the sudden, 20 ears have heard the same message and they're all going to pick up something different and they're all going to have some ideas about how to implement it, and they're all going to get the same energy and same motivation. We really encourage that, too, when we go in and do coaching. While the end user may be the hygienist, or the end deliverer of the product might be the hygienist, it takes the whole team to really get that department to the next level. So, all of our coaching involves the whole team and engages the whole team. Your question was, what are some of the low hanging fruit? I'd say three things that really kind of put it all in a nutshell and then there's a lot of stuff that falls into these three buckets. One is the We Care and the appointment verification, that's probably the number one complaint we hear from practice owners is the cancellations and no-shows. One of the things that I say to them is, that's a conversation that all of us consultants could talk about for days, but first, know what it is you're dealing with. What we say is if you're seeing 20% or over open time, and we show you how to calculate that here, super simple calculation. If you are at 20% or more open time, there's very often not just a cancellation problem, but a capacity issue, so there aren't enough patients flowing into hygiene. Sometimes, the business team, or the doctor, or the hygienist kind of says, "It's all cancellations," but if you really were to go back a month and really track how much of that time was never scheduled to begin with, if you're at 20% or more open time, there's going to be a significant amount. So, what does that mean? Does that mean We Care, new patients, and then the cancellation is a whole other issues. Kim, actually, is the perfect person to interview about an appointment verification system and how to cut cancellations in half. She's done it over and over, she teaches our clients how to do it, she'd be a great person to interview about that. Yeah, and she's in Phoenix. Is she still alive or was she killed by a melanoma? No, she's very careful and she is like the healthiest person I know living in Phoenix, I will tell you. She's got beautiful skin, so she knows she has a secret. All of our coaches teach the same content, it's something that Kim kind of created and coined. The other thing that's interesting, and that leads us to the second low-hanging fruit, is yeah, I've been doing this a long time and speaking and coaching, and you kind of think that people get tired of hearing the same message, but still we get calls every day from practices that have no real structured perio program. Maybe they had one once and some of the hygienists left or maybe there was some obstacle that they came across and it just kind of all went away and they're not really implementing it. There are all these perio patients that are having [profees 00:16:06] and everybody's kind of frustrated, but they don't really know what to do about it. You're saying the billing codes, 25% a year, income revenue should be perio? Yeah. We measure it a little differently, but it all comes out to be about the same. [crosstalk 00:17:15] hygiene. So, we look at procedure codes, we compare the scaling root planning codes, perio maintenance codes, and adult [profees 00:17:23], but if you look at the revenue of hygiene, it's not that far off of a comparison as far as how it's measured. ... they're going to get the hygiene exam. Yeah. Yeah. So, we kind of have changed our philosophy on that a bit. It used to be that we believed that it all went to the hygiene, assuming and considering that the hygienist is doing 85% of that data collection and really handing off nicely to the dentist. I'd say now, with practices that have multiple associates, also with kind of us as an industry needing to tighten up our documentation and our coding, and all of that, we have changed our philosophy. Now, we recommend that those go to the dentist, but again, my point of saying ... You talked about the dentists that take their whole team to CE, it's the same thing when you're working in the office. That dentist can't carry all the diagnosis, the dentist can't carry all the marketing. They've got to motivate their team to help them do that and those are the most successful practices, when everybody's engaged. Whether it's in the appointment verification or a supporting perio and believing in it. Talk about preemies, gingivitis, there's actually a case that was out of Case Western University and they're doing more and more research on this, of a stillbirth that was caused by perio bacteria. I have a friend who just had open heart surgery and showed me his bill, a million dollars. Imagine if our treatment of periodontal disease can help reduce our patients' risk of preterm labor, still birth, heart disease, type two diabetes, stroke, cancer. This is real stuff, it's not a myth anymore. ... the guy ... You read that book? Yes. I just bought four more today to give away at lectures coming up. Well, summarize it. He's going to come on the show later, but what was your takeaway from Beating the Heart Attack Gene? Yeah. We've been following Brad Bale and Amy [Dunny 00:19:55] for years. In fact, some of our coaches have been to their live preceptor programs, I've taken on their online preceptor program. Really, what they're teaching is they're teaching the dental industry and the medical industry that there are ways to overcome genetic and other types of predispositions for our heart disease, and stroke, and type two diabetes. Most of it comes back to inflammation. So, what they're finding is that these periodontal bacteria ... Dr. Bale will probably share this, he's extremely passionate about this when I hear him speak about it, so it'll be really insightful, you've got to listen to it. Is multiple studies where patients had carotid endarterectomies, so they basically open up the carotid artery and scrape out the plaque as a treatment modality. Some people say, "Well, okay, so maybe someday I'll have a heart attack, maybe I'll have to have a bypass or a stint-"
... the problem with that is that you have 60,000 miles of blood vessels and only three miles of those 60,000 miles can you surgically repair. So, all that stuff is happening your brain, dementia, organs, kidney, liver, all that stuff. You said three hanging fruits, you said one ... Did you say We Care or ... Did you stop calling it Recall and now you call it We Care? No, but I like that. Hey, I might take that, I might steal that Howard, that's pretty good. No, recare and appointment confirmations, that's the scheduling pieces is one. Perio, making sure that you have a really tight ... It doesn't have to be overly aggressive, some dentists get really nervous about that, that they're going to drive patients away, it doesn't have to be that way. Our clients repeatedly are presenting treatment to patients that they've been seeing for years and years and they're nervous about it. How do I talk to them about it now when I haven't seen this patient for 10 years? So, we give them some verbal skills, we give them ways to really bring the patient alongside them in the diagnosis, and they have great results. So, perio. Then the third one is getting the hygiene department really, really tightened up in regards to restorative and operative enrollment. Having them tee that up. That helps everybody. The doctor's going to be a lot more likely to come in and do a hygiene exam if she knows that it's going to be concise, and it's going to be consistent, she's going to hear the same message, and it's going to be effective. When she thinks that she's going to have to come into the hygiene room and start that whole diagnostic process from scratch, then that doctor's a lot less likely to leave their chair. Then the hygienists end up waiting and then it comes this whole ... There's so many things in the practice that are related to hygiene they're not even always aware of. Things that create these kind of cycles of frustration that if we could overcome that, a lot of things would smooth out. The best dentist and the best quarterbacks in the NFL have the same thing in common, they're perfectly consistent. If every time you diagnose the same way, and every time you explain it to the patient the same way, your assistants, and hygienists, and treatment coordinators, and everybody's hearing it, everybody's on message, everything's consistent. Those quarterbacks, every single step they have ... The line can block so well because they know, "Okay, he's going to throw in four second, you've just got to hang on for four, and at four, he's going to give it all he got, you can let it go," because he knows his quarter." You have these dentists and every time they come in it's different, it's inconsistent, so she tries to co-diagnose, and then he goes somewhere else, and finally she just throws in the towel. Yeah, [crosstalk 00:24:26]. Let's elaborate that on, the throwing in the towel because that's exactly what happens is the hygienist will shut down. So, dentists, whether you like it or not, one of your jobs is to help build up your team's confident, their confidence in you, and their confidence in the team, and their confidence in themselves. Just like you want your team to be consistent, so you want your team to be delivering that message to you when you come in for the hygiene exam the same way every time and you want between providers ... So, between assistants, between hygienists, you want them to be saying a similar thing. The doctors have to do the same. If you've got multiple doctors, you want to have a very similar treatment philosophy. Then within each doctor, just like you said, come in and be consistent with your treatment plan. Then if you do disagree, because it's not going to be 100% effective, there's going to be times that I'm going to recommend or share with the patient, say, "The doctor's probably going to recommend a crown here," and the doctor may come in and say, "You know what? Actually, I think we could do an onlay." Well, I have enough confidence as a hygienist and I have a good enough relationship with my dentist that I work with, that I'm not going to take that personally. As hygienists, we can't take that personally. Also, he's going to say something like, "You know what? Rachel, I see exactly why you recommended a crown and here's the good news, we can actually preserve more tooth structure because of this," and now all of the sudden, he's built me up. Instead of saying, "Well, no, I wouldn't do a crown, I would just do an onlay." [crosstalk 00:26:10] All of the sudden, you're throwing the hygienist under the bus without even noticing it, but then they're just going to shut down. You know what we do in our office for 30 years? I have the hygienist diagnose and treatment plan. The dentists say, "Well, that's illegal," and I say, "Great, let's go to the prison on Sunday and visit all the hygienists in jail for diagnosing and treatment planning." Right now, someone just drove by your office with three pounds of cocaine in his trunk, and you won't let your hygienist diagnose a cavity. What I do, I don't like the top-down command and control, so in our office, if the hygienist said, "This is a cavity, an MO on three," and I say, "I don't think so, I think it's a watch," then we both shut up and we ding the front, and then a hygienist/dentist comes in there, we don't tell them what we said, and then whatever they say ... We'll say, "Number three, is there a cavity on three?" If they say, "Yeah, that's an MO," and then we just high five like, "Okay, you won." Yeah, and furthermore, that 65 year old dentist, he can't even see his own shoes to tie them and he's trying to backseat drive a hygienist who's half his age, who do you think has the working eyeball to read a x-ray? The 35 year old hygienist or the 65 year old with a liver spot? In fact, by the time you have a liver spot, you shouldn't even look at the x-rays, you should just have your hygienist tell you. She could be your seeing-eye dog. Oh, I love it. Yeah, and by the way, everybody should be wearing loops, too, dentists and hygienists included. Yeah. [crosstalk 00:27:51] to that. We should [crosstalk 00:27:51] with a loop for the business team. They probably need loops, too. Yeah, I totally agree with you and Howard, you're singing my song because one of the first slides that I bring up when we talk about restorative co-diagnosis is that, "I'm not supposed to diagnose" myth. We understand and you're in Arizona, so you guys have some different laws than we have, but understand that if it comes down to it, the dentist is taking the responsibility for that diagnosis. But, one of the things that dentists forget to do is they forget to train their team so that they are so on point that you can do it like that. Is that you can have open conversations about diagnosis and when, perhaps, you go to [towney 00:28:41] and you learn some new technique and you try it, dentists, share that with your team so that they know what's going on and they're on track with you. This is the other thing that dentists forget to do, is they think that their team knows that it's okay for them to diagnose, they think they're just not doing it because they're lazy, but very often what's happened is the dentist hasn't given them explicit permission like, "No, I want you to do this and I want you to take that patient as far down this diagnostic path as possible." We use this analogy of a house with the path being the walkway, the patient enters. Well, I want the dentist to have to come out the front door of his [inaudible 00:29:23] and walk all the way down the walkway, and get the patient, and take them ... That takes way too much time. If I'm a hygienist, I don't want my dentist in the [inaudible 00:29:32] that long. We asked them, a group of dentists, one of them being one of our clients, we said, "How far do you want your team to take the patients down that path?" He said, "I want that patient to ring the doorbell and all I have to do is open the door and say, 'Yep, come on in,' and they sit in the chair and do the work." So, you've got to tell your team how far you want them to take the patients down that path. You have to be pretty explicit about it. Well, Rachel, if you're going to be a good dentist, right now, if you look at 100 million cavities diagnosed, the America debt will be drill, fill, and bill 30% of them, so that's one in three. When the team gets involved, when the hygienist is diagnosing or co-diagnosing, who cares who's diagnosing, co-diagnosing, we're not lawyers, we're patient-centered. ... it's the girl answering the phone and you decided not to take her to the continuing education course because it was on endo. You say, "Well, that doesn't apply to her." Oh yeah, she just answers 60% of all the questions of, "What is a root canal? Will it hurt? Do you think I'll have to have one?" She can't even say, "Well, I don't know, is your too sensitive to hot and cold?" "Does it wake you up at night?" ... and the fees are dropping down, so a lot of people are thinking, "Rachel, if my office is 82% PPOs, do you think I should switch to assisted hygiene? Instead of having two hygienists for $40 an hour in Phoenix-"
... "do you think I should get a $40 an hour hygienist and a $20 an hour assistant-"
... "and that would cut my labor costs 25%? Because the adjusted production off the PPO is 42%-"
What would your thoughts on assisted hygiene? I think assisted hygiene can be done very well, with some caveats. So, it can be done, like anything, it can be done really well or it can be done really poorly. The really poorly are the ones that people usually hear about or they experience and they say, "I would never do that, it's the worst thing for the patients." But I've seen it work really well and I think some of the keys are, you've got to have a really ... You've got to have a top notch dental assistant. Somebody else that you might want to interview about this is Stephanie [Lauding 00:33:17]. I don't know if you've interviewed Stephanie [Lauding 00:33:20], but she's super. She has actually hired a lot of young dental assistants and trained them. If you have someone in your team that can really train, and nurture, and mentor these dental assistants and find someone who is very moldable, who wants to learn, who's super eager, has a super great people personality, then this can work. The other option is hiring an already trained dental assistant, someone who has a lot of knowledge of dentistry. I've worked with an assistant like that and it was phenomenal. I just told her, "You tell me what to do. You tell me what to do, you tell me where to go." So as a hygienist, I've got to get over myself a bit, Howard, I've got to not be the prima donna hygienist and say, "Well, I'm not going to have an assistant tell me what to do." No, they're going to be my traffic control. I want them to tell me where to go, what's next. Either you've got to have a really strong training program and have hygienists that are willing to train a fresh dental assistant and make sure you hire for people skills, and hire for coachability. Or, you've got to already have a well established dental assistant that is very confident and you've got to have a hygienist who is willing to let that assistant take the lead, and they've got to work as a really tight team. What doesn't work is if you hire someone and you just think they're going to clean rooms and take x-rays, that gets boring, nobody wants to do that for very long. They're going to move on or it's just not going to be a good situation. So, you really have to engage this person and have them be a very, very integral part of the whole patient experience, I think, for that to work, but that's one solution. Hey, here's the deal, I was just talking to a dentist the other day in kind of a rural area of Pennsylvania, and he said he got back a reimbursement for a 4342, like a localized [inaudible 00:35:25] of therapy that was $35. Well, if he's paying his hygienist $35, he's going in the hole. It's negative on that procedure because there's usable ... There's consumable, there's gauze, there's anesthetic, there's the wear and tear on your instruments. So, I still see more fee for service practices than I think that I will see, so that's always interesting and pleasantly surprising. We had several that I spoke to this week that are still doing really well, but I think there are some solutions out there and I think that there are also ... This guy in Pennsylvania said he got ... This particular insurance company was trying to get 85% of the dentists in Pennsylvania to sign up and then once they did, now they've got too many, so now they're dropping the reimbursements to try to get people to opt out. I was like, great, that might be the best thing that ever happened to you. ... she was episode 645. Yeah. Podcasts are a lot of kids and so, this is heavily weighted to the under 30. What are your thoughts in general about PPOs? Do you think it's something where, this is reality, you've got to sign up for all the PPOs? What are your thoughts on PPOs? When you guys go in and consult with offices, do you analyze the fees they're getting? Like how much is hygienist cost? ... and what the PPO plans are paying for cleanings and all this? Is that the same as adjusted production? Compared to hygiene compensation, so yes, we do look at that. We look at particularly if the practice is at a point where they're considering hiring another hygienist, if their reimbursements are really low, this is no secret, sometimes it's just not even worth it. It would be better to drop a plan or go to assisted hygiene, than to hire another hygienist and go even deeper into the hole of that. I hate to say that, but you have to look at it from a business perspective, too, and what I don't want to see is ... When I hear things like $35 on a [inaudible 00:38:06] planning, what comes to my mind is the salaries of the dentist and the assistants, and everybody on the team. If those are reimbursements, something's going to have to give and how is that going to affect our dental salaries. I think it depends on where you are. I heard you say recently about folks getting out and building a new practice or wanting to buy a practice, and everyone wanting to be in a metropolitan area. I live in Charlotte Metro, so I have all the benefits for that, so it's easy for me to say, but a lot of our most successful practices are in rural areas where they don't have as much competition. I'm sure it's that way in Phoenix, in Charlotte there's a dentist on every other corner. So when you're in that situation, you sometimes have to do things to be competitive, but it doesn't ... There's lots of different opinions about this. I'd say most of our clients are participating at some level and I would say that maybe 20% are almost 100% PPO with very little fee for service. There's probably another 20%, maybe 25% or 20%, they're still completely fee for service. Then everybody else is somewhere in the middle and they may be taking some of the higher reimbursing plans. Now, when it gets into a really heavy PPO practice and they're asking us those questions, we refer to a PPO expert to do analysis and really look at how could that affect the practice. I'm a business owner and if 40% of my business was coming from one referral source, it's a little scary to drop that referral source. We've had similar conversations in our business and it's scary to think about dropping that referral source, but if you can really get down to the math and look at what it might mean to your overall collections, then very often it makes sense. Who is your short list of PPO experts that you [crosstalk 00:40:25] that office? We've worked with Unlock the PPO, we've worked with Theresa Duncan with Odyssey Management, and I don't know if she specifically does that PPO analysis piece. Roy [Shelburn 00:40:42] also is fantastic, he's one of our go-to resources, Dr. Roy Shelburn. I'm sure you've had him on the podcast, look him up. He's on our short list, too, of just helping our clients navigate some of that and also figuring out when their services ... Things are happening ... I was at a speaking engagement in Virginia recently and one of our clients was there and he came up to me and he's like, "Look, this company is not only denying reimbursement, but they're disallowing this perio therapy on a patient that obviously has periodontal disease." It almost makes you ... It's not just about the money, it's getting to where it's about the care. Yeah. It's funny how all seven and a half billion earthlings are trapped on the same rock flying around the sun and I've noticed through lecturing internationally for 25 years what's going on in one country is going on, on the other side of the world. It's really more homogenous than anybody would think. I've seen this rodeo before with the NHS, I remember 30 years ago the fees just kept getting lower and lower and lower. Finally, the [inaudible 00:41:52] are saying, "I'm losing money and the care if horrible." So, the first guys started trickling out 15 years ago, now 5,000 of the 20,000 have left it completely. The PPO, if it's just a slippery slope to the bottom, then America's going to wake up to the fact that 40% of Americans don't even have insurance. That's what I don't even understand about the dentist is, when you say, "Well, why don't you spend 5% in collection going after the 40% of America without insurance?" They go, "Nah, I don't want to do that." Then you send them to PPO, "Hey, why don't you do your dentistry 42% off?" "Okay, fine." So, they don't blink at doing it at 40. Then the other thing about when they're adding another hygienist, the average dentist's gardener is smarter than he is or she is because they all do selective pruning. When they do your landscaping, they plant eight trees because they don't know if one, or two, or three are going to die. Then by the time they all start getting bigger, they select or prune to three. So, this dentist wants to add another hygienist, why don't you evaluate those PPOs? Maybe what you should do is say, "Okay, we're doing 12 PPOs, let's selectively prune off three-"
... "that we're breaking even or losing money, or they're affecting the care of my patients." Because if you're losing money, it just feels better when you're losing money on several hundred people instead of just one. I can selectively prune losing money on one guy, but when you're saying I'm losing money on hundreds, I've got to keep doing it because I'm a talking monkey with clothes on. When dentists go to the zoo, they're the only animal with clothes on, all the other ones are naked and don't have crazy thoughts. I want to ask you another question dentists always ask. I've been asked this a million times. Do you think you should pay your hygienist hourly or production? Great question. I will say that the most motivated hygienists that we see have some type of incentive, and usually it is tied to their performance. I'd say probably the one that we see that's the most effective is a hybrid, a base plus some type of commission. Typically, the base is a little lower than what the going rate is, and then they have to hit the three to one, so they have to produce three times what their total compensation package is. Then once they've hit that, then whatever's over that, they get a percentage of that. So, you think hygiene salary should be 1/3 of hygiene revenue, adjusted production revenue to the hygiene department, minus the exams that went to the doctor? Nice. Nice, nice, nice. Well, if you talk to anybody who has a PhD in economics, they'll say, you've got to incentivize people. You just said that the best hygiene departments you see, there's some type of incentive program. Yeah and we've seen all different kinds. We've seen it even where they were pooled. We worked with one office in Texas years ago and they had about four or five hygienists, and they worked on a pooled commission. So they put all of the production together for the hygienists and all the hygienists were paid the same amount from that pooled production, so they're all helping each other. The tricky thing is, too, is you've got to ... There's pros and cons to everything. There's pros and cons to hourly, there's pros and cons to salary, there's pros and cons to straight commission. One of the cons to commission is the teamwork aspect, so you just have to really look at the people that you have on board and make sure you've got team players and folks that aren't just out for themselves because if there's even a hint of that, then that production compensation model sometimes will ... It will accelerate that. ... if you own a football team, a basketball team, a dental ... It doesn't matter. I don't care if you're running a school, a department of motor vehicles, HR is the toughest job, and the most successful dentists are part time armchair psychologists, leaders, motivators. Whether it's with their patient, their team, that's the whole damn game and it's the hardest to train. It's just so hard. This is dentistry uncensored, so get to the nitty gritty, what do you actually do? What does it cost for a dentist to call you? How much does it cost, you come in there for one day, three days, you come back once a year, once every ... Tell us what you do. We have some online training, but our primary product is our private coaching. We have quite a few clients who stay with us for years, we're building a master's program so that dentists can just continue to send their hygienists and send their teams to us over and over and keep them engaged, and motivated, and growing. Typically, the dentists come in, they call us up and say, "Hey, I was visiting with my friend or I was talking to my CPA or my financial planner, and my hygiene department hasn't grown in a long time, I'm frustrated." I had one doctor I talked to this weekend, talked to him three years ago, and he finally circled back around. I said, "So, I looked at your numbers again, they're exactly the same as they were three years ago." He said, "Yeah, that's why we're talking." He was ready to make the change, really great guy, but sometimes it's a lot to ... Dentists are sometimes very slow to make decision. I find they're either drivers and they go-go-go, let's do it, or they think about it for three years and then they circle back around. The way we start is, we have a couple different levels of programs. We have one called our kickstart program, which starts at around 2,900 a month for about four months, plus a deposit. That's typically for a practice that's up to about four hygienists. Once you start getting a little bit bigger, we charge a little bit more. We also work with groups, we've got several clients that have multiple locations and work with some small groups, and we do customize pricing for them, obviously. That program really works on one topic, it's one two day visit followed by about three months of coaching calls, and that's usually the practice that they've got everything else is running great and they want to work on their perio program. Our program that we enroll in the most is called Elevate, it's 12 months. It's two, two day visits in the office and for about half that time the team is seeing patients, so we don't try to shut down the office for two whole days, we try to keep them seeing patients as much as possible. Then the second day is a full team workshop where everybody's there, everybody's engaged. Then there's coaching support all along the way. We do some pre-work, we do a very detailed analysis of the hygiene department and track the progress, and really customize it to what the client's looking for. Obviously, the top three things that we work on are the perio program, really getting that refined, whether they don't have one at all and they're starting from scratch, or they do and they want to add things like advanced diagnostics, which is one of the things that Brad Bale might talk about when he comes on the podcast. They highlight that in the Beat the Heart Attack Gene. Stephanie Lauding does a lot of that, as well. Or other diagnostics, they just want to up level their period program. ... the only secret to lower price is lower cost. When you accepted 42% reduction in fee, did you lower your staff's fee? Did you say, "I'll go 42% faster?" Instead of doing $1,000 a day, I'll do 14 ... They don't have any plan, they just said, "No, my only was just to give everyone a raise every year while signing up for more PPOs," and it's a disaster. I want to say this to my homies out there. The Kickstart's 2,900 a month for four months. The Elevate is how much a month for 12 months? Four hygiene, those are the big boys. What is the average dental office size? See, you're just making my point. I just exposed your bias and I've been saying this for 800 shows in a row. You look at data from an economist that works for the American Dental Associate, what's that guy's name? I can't say his name, Marco [Vusacheck 00:52:30]? Marco [Vusachek 00:52:32]? Genius guy. The average office is doing 750. A totally successful consultant like you who has been doing it for 20 years, you say, "Well, you know, the average office has two hygienists, but most of our clients have four," ding, ding, ding, ding, ding. Because everyone using consultants are millionaires. Then you'll see this, you'll go, "I'm not spending $27,000 on-"
... "building my business. I'm going to guy buy a shiny object with lights on it, preferably with a dial and an antenna." Or he'll say, "Well, you know what? If I went to this forensic odontology conference to identify dead people, that and TMJ will be a big practice," or they're going to sleep apnea. It's like, dude, get your house in order. That's the bias of consultants. They all think every dental office is twice as good as what the people ... It's the same thing in every conference. The right half of the room, every row is an entire dental office, those guys are all making 350, 400. Then you go to the other side of the room, it's a bunch of individuals saving money and their wives couldn't come because she's out selling Amway and they're all making half the money. You've got to get the whole team involved and the number one return on investment is to get your house in order, get poised for growth, get mean and lean, and then you can go play with sleep apnea and forensic odontology, going to the morgue on Friday night, whatever. Whatever flips your flipper, boys have toys, whatever, but get your house in order. How many offices have you got their hygiene house in order? Oh my gosh, I don't know, hundreds. They always tell us, the dentists say, "Okay, A, other than the work that the hygienists are sending to the doctor's chair," which they want, keep them busy. The rest of it is, their hygienists are happier because they're not just running through a [prophy 00:54:41] over and over and over, they're actually able to engage their brain and talk to these patients and be a colleague to the dentist. The patients are healthier, the dentist isn't having to do all of this production. So every time they add a new services, that's more that they're doing, and the patients show up in their chair and they're not bleeding all over the place when they're doing a crown prep because the perio's been treated. Their team believes in the treatment that the hygiene's doing. It just has all of these trickle down effects. We get doctors telling us all the time, "Oh my gosh, my hygienists used to hate coming to work and she just gave me a note that said, 'Thank you for investing in us. I love my job again.'" Now, all of the sudden, they're going to stay. You're not going to have employee turnover and you're going to have people that really care and really engage and want to build your practice, and you make your investment back over and over and over. Just like you talking to somebody that's been married 20 year, they'll say, "We had great years, average years, some bad years." I want you to talk about what do you mean when you say that what happens in the first 20 minutes of a hygiene visit affects the entire practice? Yeah. One of the exercises that we go through in a lot of my speaking programs is I have dentists write down, what do you think your hygienist does in the hygiene exam every time without fail? For example, if you have a 60 minute hygiene appointment, you could break it down, first 20 minutes is the evaluation, the assessment. First step is, how much time is being spent on that in your practice? If your hygienist are seating the patient and then six minutes later they're scaling, then not very much time is being spent on the diagnostics. Probably not consist perio charting happening, probably integral photos happening, probably not real thorough co-diagnosis happening, it's all about the scaling. If we reserve that first 20 minutes and the hygienist is really spending that time doing all that data collection, then all of the sudden there's all this treatment that come out of it, but what if they aren't doing a perio exam, for example? So, they're not doing the perio assessment, and so now all of the sudden that patient has periodontal disease but it's not getting diagnosed, and that hygienist is having to work super hard on the prophy and they're running behind. Then the next patient's sitting out in the reception area and they're staring at the person that's working in the front. Staring at them because they're like, "Why is my hygienist running late? Why haven't you seated me?" Then all of the sudden there's another patient that hasn't been diagnosed with perio in the doctor's chair, she's trying to do a crown prep and is running behind. Now, all of the sudden the next patient of the doctor's is staring at the practice manager. Doctors, because the tissue's bleeding, doctor and assistant are having a hard time. All of these things, plus you've got liability. If we're not doing oral cancer screening, or we're not doing a perio screening, there's a liability because of undiagnosed treatment. There's the production that's lost, there's the board hygienist that's just doing one prophy after another. All of those things could have been improved if there was a clear cut plan of what happens in that first 20 minutes and it happens consistently. Then all of the sudden the hygienist calls for an exam, doctor exam, doctor's running over, there's two patients waiting, and now, me the hygienist, I'm calling for an exam when if I had done that perio charting and carved out the time to do that, all of those problems could have been eliminated. You also talk about what dentists have forgotten to do that would dramatically increase their team's effectiveness with a rolling restorative treatment. Yeah, we talked about that. They've forgotten to really train them on their treatment philosophy and continue to train them. Doctors learn new things as they use new services, their team has got to be on point. Just like you said, the team has got to be able to diagnose better, as well, or better than the dentist. In order for them to do that, the dentist has got to really train them so that they're all calibrated on their treatment philosophy. Then give them that permission, we talked about that. I want to talk about ... By the way, throw my homies under a bus, I do it with love. I do love dentists, I really do love my homies, and I do think they're doing a far better job than MDs. The only great businesses I see ... The dentists, the vets, and the chiropractors are running 10 times the better business than the one million MDs, which are clueless. I know they always want to learn dentistry, but my top two investments, number one is consultants, number one. Number two, when you said the hygienist's running late and that patient's out there because you said, in a [inaudible 00:59:50], because she's looking at the clock and she hasn't been seated yet, she's wondering, "How come I haven't been seated yet?" Then I look at the cost, the number one cost is not even on your P&L, your statement of income, it's a 42% adjusted production from you charge 1,000, but you signed up with the PPO for 600. Number two, 28% labor. Number three, 10% lab. Number four, 6% supplies. Operatory chairs aren't even in your top 10 costs and every time I analyze dental offices and I say, "You know what, Mr. Rogers? One of these things don't look like the other." When the people are always netting three to 400, one of the top three variables they always have, they always have extra chairs. They always have an operatory that no one even sat in. Because when you're running late, we talked about assisted production, there's various levels of that. ... is infinitely shorter than pre-process waiting in the mind of a monkey. Sometimes, I'm a pathological liar because I will go in there and numb up my next patient and I look at Jen and I say, "Jen, how long should this soak in?" She's like, "25 minutes," which means I'm running 25 minutes late. If I tell you, "Rachel, I don't want to hurt you, we're doing a root canal, I want this to soak in-"
... "for a half an hour." Then I'm going to come in and it'll have worn off and I'll give you a booster shot and we'll do the root canal [inaudible 01:01:25]. You know what I mean? ... is better than pre-process waiting. ... sometimes we have cancellations, sometimes you're running late. So, the number of operatories has to match the flow, not the total aggregate demand. Right, Howard, I'm going to interrupt you, if I may? Go to ROHbook, that's the easiest way to get there. ROHbook.com and then you're going to enter HOWARD, all caps, and then you'll get 50% off, half off the book, and we will ship it to you. ... like Ben [Burse 01:03:05] in Arkansas. I'm familiar with him, yes. ... he thought that when these kids are coming in, getting their ortho appointment, he's a real doctor, why can't he have a hygienist? Arkansas ... That was a big deal. Anyway, you should write a book review on this. Yeah, that would [crosstalk 01:03:29]. I would love to do that. Yeah. I'm Howard@DentalTown.com, the editor is Tom [Giagovi 01:03:36], since the year 2000, he's been here for 17 years, so he's Tom ... Is it Tom@DentalTown? Tom@DentalTown.com and/or even an online CE course. These are all just different [inaudible 01:03:50], there's really no difference in an article, a podcast, and online CE course, but the online CE courses, that's [HOGO 01:03:56], because I am Howard@DentalTown.com, he's Howard Goldstein, so he goes by HOGO@DentalTown.com. I think the online CE courses, we put up 411 courses that are coming up on something like 700,000 views because you get ADA credit, AGD credit. The other thing that the online CE courses are doing is, so many dentists are using them for lunch and learns with there staff. They'll sit there and say, "Okay, Friday, we're going to stop seeing patients at noon, I'm going to pay you for an hour-"
... "but I'm going to provide lunch, but I want you to watch this course." Because a lot of these dentists are realizing that if they stop an hour early once a week, buy everybody lunch, you have to pay them. ... the only way they can not pay them is volunteer, but stop an hour early, get a bunch of pizza, send someone to choke and puke and get a bunch of crap, and let them all sit around and eat, but let everybody as a team watch a third party online CE course. Because the receptionist is answering all the questions, the assistant is always wondering what the hell you were doing in the tooth for so long, and the hygienist is going to be in there for an hour to explain this whole thing, and they'll feel comfortable to ask her questions. Then when the doctor walks in they're just like, [inaudible 01:05:17], do you have any questions? No. Every time ... I've asked my assistant, Jen, for 30 years, every time I ask the patient, "Do you have any questions," they say no, and then I walk out of the room. Then what do they turn to Jen and say? Six questions. Right, yeah. Do I really need that? What is the crown? Yeah. You know what the questions all have in common? They're all trust. Really? Do I really have two cavities? Really, I have to get them done? Really, if I don't do them they'll turn to [inaudible 01:05:47]? It's because we sell the invisible. Just like when I go get my oil changed, he says, "You need to flush your transmission fluid." What would I base that on? Yeah. We sell the invisible. You can show me transmission fluid that's full of trash, done. That's where the [inaudible 01:06:08] photos come in and things like that. The more we can back up what we're saying with that proof, then we shortcut that whole trust piece, I think. Not shortcut it, we fast track it. We fast track from the invisible to, "Okay, I see what you're talking about. All right, let's do that." But, I still think the biggest trust buster in the hygiene department is when you keep losing your hygienist and you keep getting a different hygienist every two or three years. That's another thing, when I go in there and see these amazingly huge dental offices, they've got hygienists that have been there 20 years. Some of them are so old they eventually have to take them to a vet and put them down. Keeping your staff says the most about trust. Yeah, I will. I'll connect you. ... today, I had an awesome time. Thank you, Howard. It's a pleasure. Have fun. All right, tell T-Bone I said hi.